Belmond Cap Juluca’s Maunday’s Bay always takes your breath away. By morning? 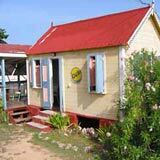 It is extra-special, with friendly fish scurrying by the sea rocks and sweet birds singing. 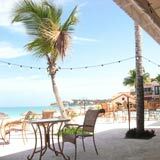 It is no coincidence that this is Belmond Cap Juluca's breakfast spot. 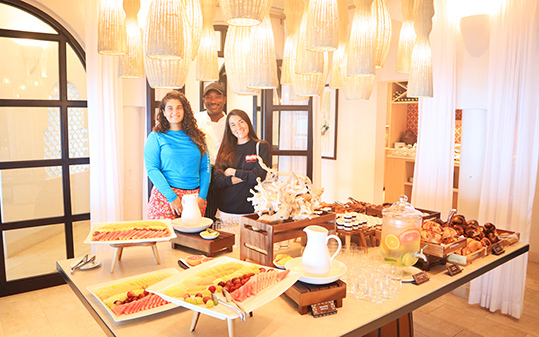 Every morning a world-class breakfast is served at Cip’s by Cipriani and Pimms restaurants, stretching over Maunday’s Bay. Yes, mornings on Maunday’s are more magical than ever! 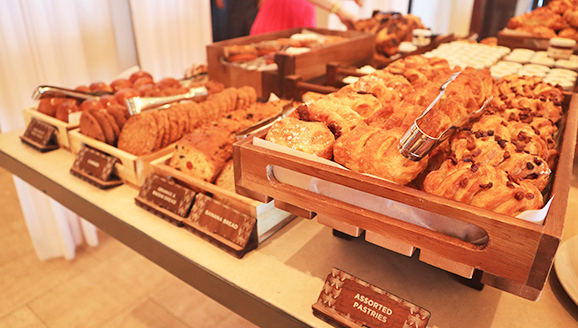 Belmond Cap Juluca’s breakfast buffet begins with a huge assortment of crumbly, flaky, beautiful pastries! 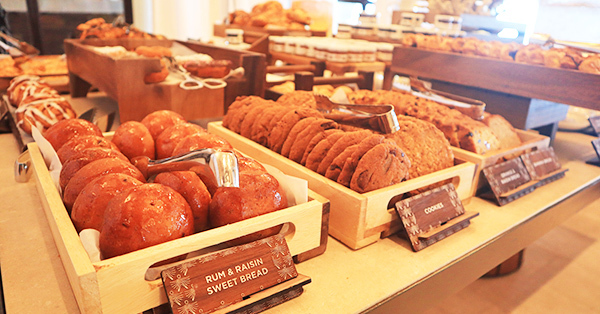 Their culinarily team whips up a large variety of freshly baked goodies every morning. 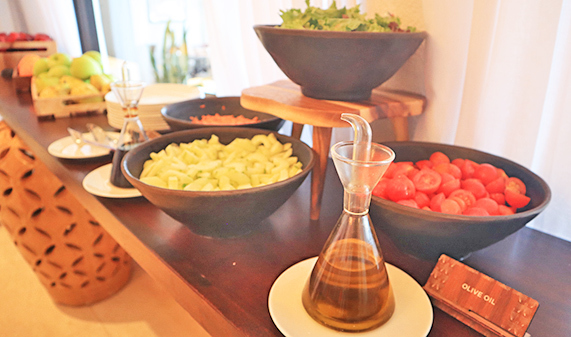 Prepare to fill your plates with mouthwatering treats at the pastry and fruit table. 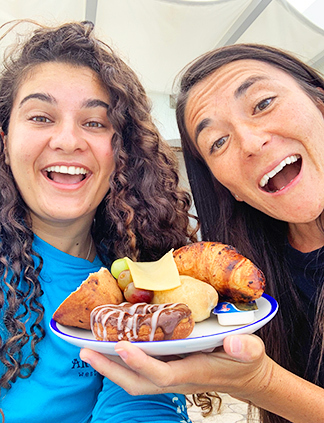 We were told that we had to try the chocolate croissants and coconut danishes. They are favorited by everyone! Nori fell in love with the chocolate croissant. 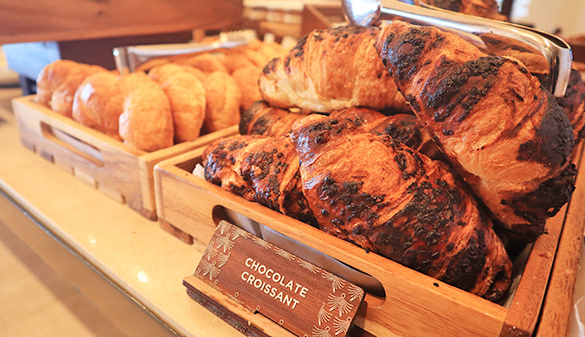 It is not your ordinary chocolate croissant. This one is filled with oozy Nutella. For Nutella lovers, it doesn't better than this. And most eye catching of all? Doughnuts! These pillowy pieces of heaven are rolled out with love, fried to perfection and the sweetest part of all? They are finished with a variety of eye-catching toppings… chocolate glaze and pink crystals, chocolate with a vanilla fondant glaze or a simple dusting of sugar. We could not help ourselves. We had to try the chocolate glaze with fondant icing and the original sugar-coated doughnuts. 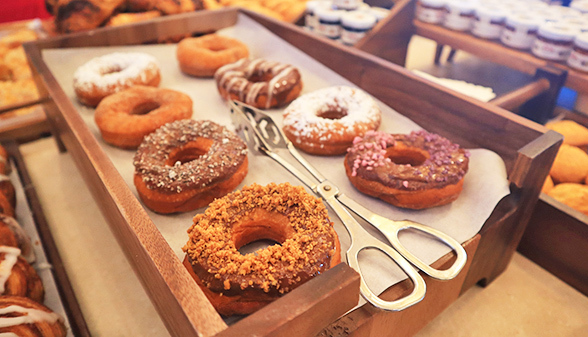 A Belmond Cap Juluca specialty, this is the only place on island where you can find such pretty homemade doughnuts. The man behind the pastries? Cap Juluca's head baker, Ron who actually learned to bake with my father Bernard Fayet from Le Bon Pain. One thing is clear, Ron KNOWS pastries! 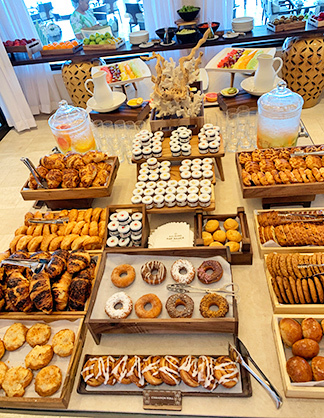 The pastry table is heaven for anyone with a sweet tooth. 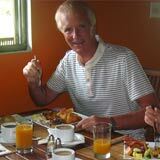 Moving on to healthier breakfast items, Stefan showed us the rest of Belmond's breakfast buffet. One of his favorites? The fresh fruit smoothies. The fruit smoothies selection changes daily. On our visit there was the green melon, kiwi and green apple and the cantaloupe, pineapple and mango. Fresh fruit juices are also up for grabs. 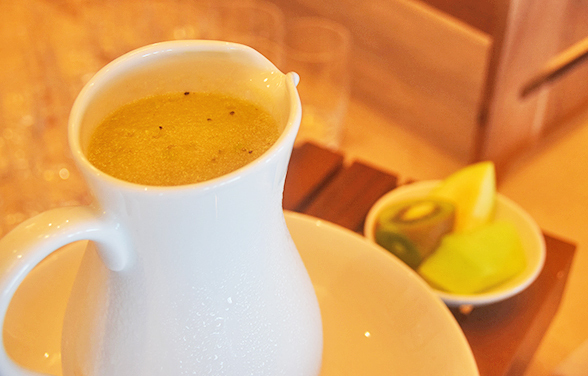 Choices include guava, mango, orange, grapefruit juice and a medley of fruit water. Save space on your plate, though! 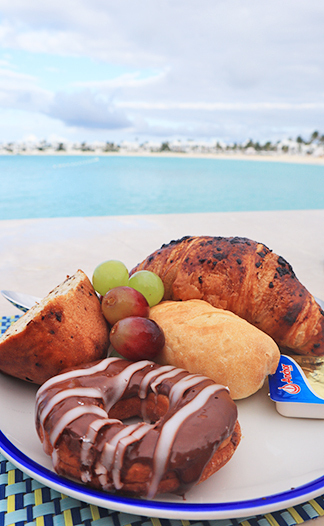 The breakfast buffet does not end there. 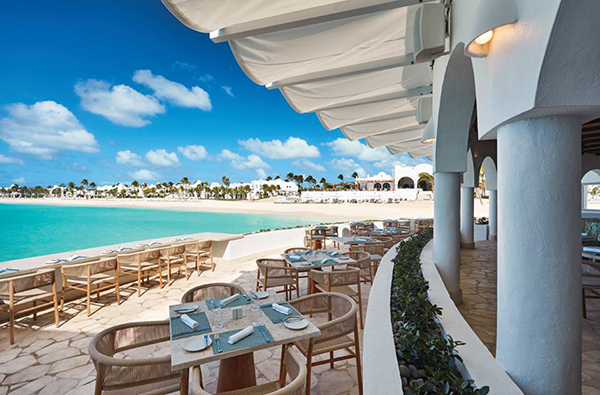 Cap Juluca's breakfast room splits in two. 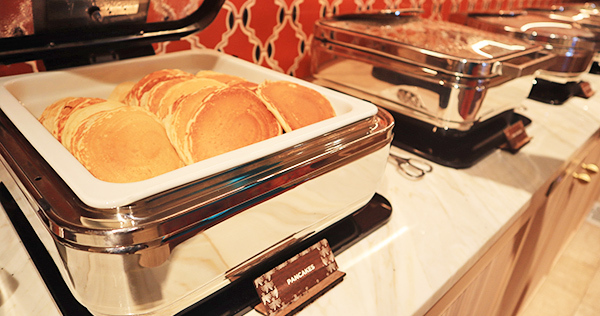 A whole other world of breakfast options awaits. 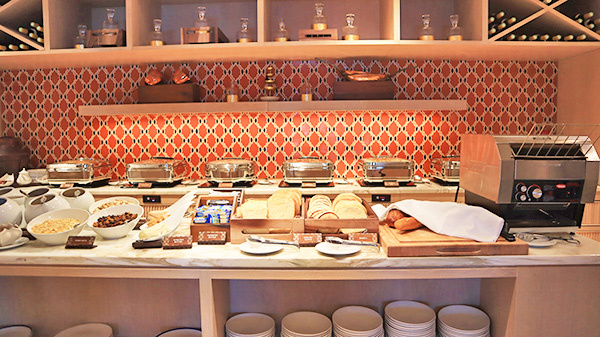 A red tiled room, Cap Juluca's second breakfast area is so captivating. Stefan explained that the designer added touches of vintage bronze pans, wine bottles and gold jars to make the room pop. A most stylish space! You are immediately greeted by freshly baked bread. The options are seemingly endless with whole wheat, baguettes, English muffins and even raisin bread. How would you like to top your toast? 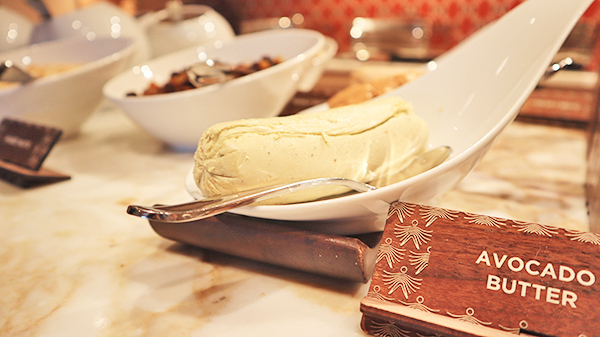 Belmond has a varied selection of butters. Cinnamon butter, peanut butter, Anchor butter and even avocado butter! Bagels are also available with all of the toppings. Cream cheese, smoked salmon, capers, red onions and lemon are always yummy with a toasted bagel. Next to the bagels, Greek yogurt is made daily, blended with fresh fruit. 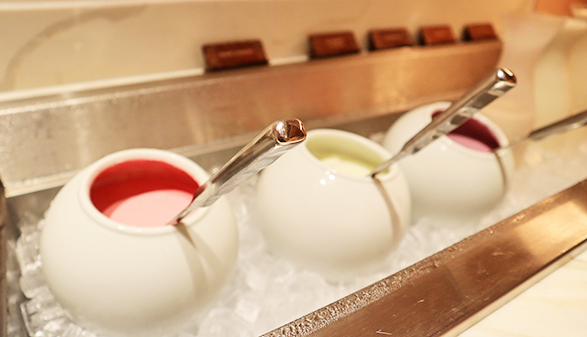 Plain yogurt is also on deck as well as tons of toppings. Mix-in your choice of homemade granola, nuts, seeds and fruits. 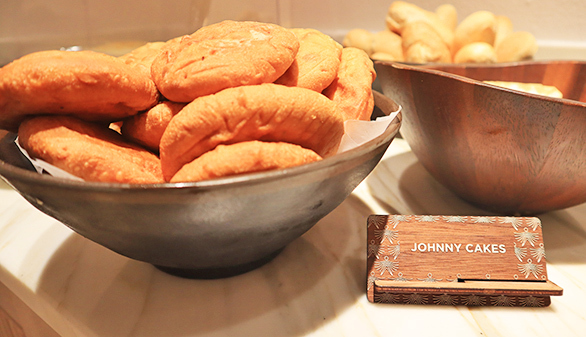 Just next to the Johnny cakes are sliced meats and cheeses. They go perfectly with a warm Johnny cake! 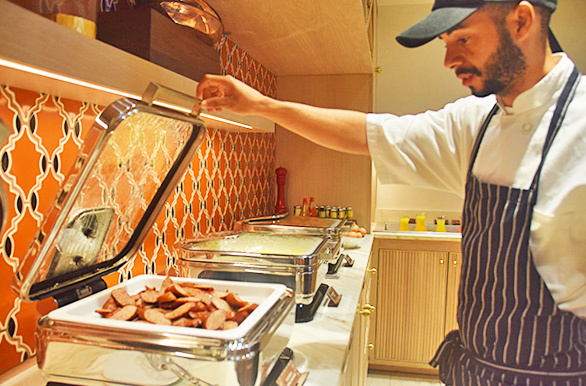 Lastly, my absolute favorite part of the buffet, the hot breakfast items. The pancakes get my vote for best ever! Puffy and soft, add your choice of nutella, maple syrup and a dusting of cinnamon. Next to the pancakes is a mountain of bacon, chicken apple sausages, creamy scrambled eggs, boiled eggs, and the most DELICIOUS potatoes. Homemade, these sautéed potatoes have hints of peppers and onions. They are the most flavorful breakfast potatoes! With fully-loaded plates, we headed to our waterfront table. The extra-special cherry on top? Dining to a Maunday’s view! Can you tell we are happy campers? The entire team at Belmond Cap Juluca does a fantastic job, right from the moment the sun rises. Every morning it is all hands on deck. Each person on the team carries out their job with passion, from cutting the fresh fruit, to baking the muffins, decorating the doughnuts and ensuring that the pastries are constantly restocked, and then there is your kind hostess who diligently refreshes your coffee cup. 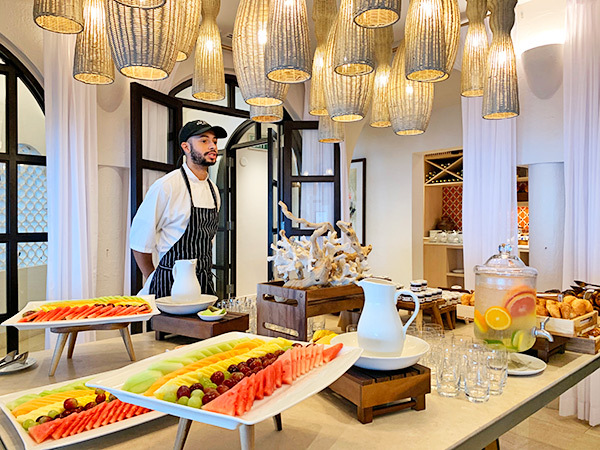 So much time and care goes into breakfast at Belmond Cap Juluca. You always leave happy and full! 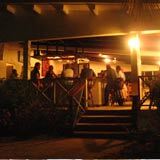 At $35/person, it is one of the most high value breakfasts in Anguilla. Reservations required.